Well, it is about that time (OK - probably past time, but whatever). Sigourney isn't going to get adopted hanging around our living room - though she is posted online. She is off today back to the rescue and then will go to one of the partner stores. She is going to one that does a pretty brisk adoption rate, so hopefully her family will find her quickly. Good luck tiny girl - it has been a pleasure. 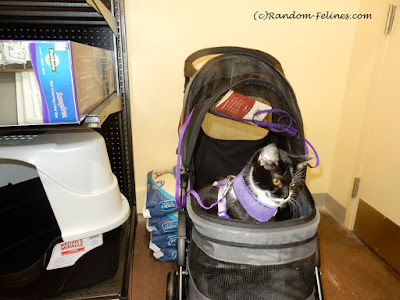 Mom posted on Cats Going Places about getting a stroller for Chanel. She hasn't made any final decisions, but is leaning toward getting one. It would just be so much easier since some princess has decided she won't walk but likes to jump out of the cart. Stay warm people - it is actually supposed to be a little bit nicer here this weekend. Mom was supposed to go to Tennessee to visit family, but our grandma has the stomach bugs so mom is staying home. Good luck, Sigourney! We know your forever family is out there, probably looking for you right this minute. Have a good weekend! I hope Sigourney finds her forever home quickly. I hope your Grandma feels better soon. Sigourney, we sure hope you find that forever home and soon. We know there is someone out there that wants such a pretty calico such as your self. You all have a great day. Paws crossed that Sigourney's home shows up very soon! Yeah, I can imagine that finding a quiet spot for clicker training at your place is a little difficult, MOL! Good luck, Sig! You're going to make your future family so very happy. I had to laugh at Chanel being easily distracted and doing things her own way ... she and Bear must've gone to the same cat school. I thought I was stubborn ... but Bear broke the mold! Sigourney is a pretty girl, I am sure she will get adopted quickly. Good luck to little Sigourney! She is such a beauty; we're sure someone will give her the perfect forever home soon! Here's to hoping Sigourney gets adopted real soon! Good luck, Sigourney! We sure hope your grandma gets better very soon. We hope Sigourney gets adopted real soon. Trying to train a cat with so many others around will indeed be a challenge.